Geodes and nodules may look like they're simple rocks at first glance. But cutting them open reveals interesting insides. Geodes are hollow within, while nodules are solid. Both can contain crystals and other substances. Geodes and nodules are two kinds of rock formed by different process over time. While similar, geodes have hollow interiors and nodules have solid interiors, both often containing crystals or other minerals. Geodes are rocks that are hollow inside, rather than solid all the way through. Geodes are generally round, though some are egg-shaped. They can range from the size of a nut to several feet. Most geodes are approximately the size of a basketball. When broken or cut open, geodes reveal a lining of crystals or other materials inside. Many of these crystals can be quite beautiful, such as the purple quartz known as amethyst. Some geodes even contain liquid petroleum. Calcite geodes contain white crystals, but sometimes these can be other colors, and under fluorescent light additional colors show up. Other examples of geode interiors include celestite, agate, smoky quartz and rose quartz. Chalcedony is a common mineral coating for many geodes, and it is permeable to water over time. Anhydrite geodes have interiors that resemble cauliflower. Other examples of minerals found in geodes include gypsum, calcite, dolomite, pyrite, ankerite, aragonite and goethite. 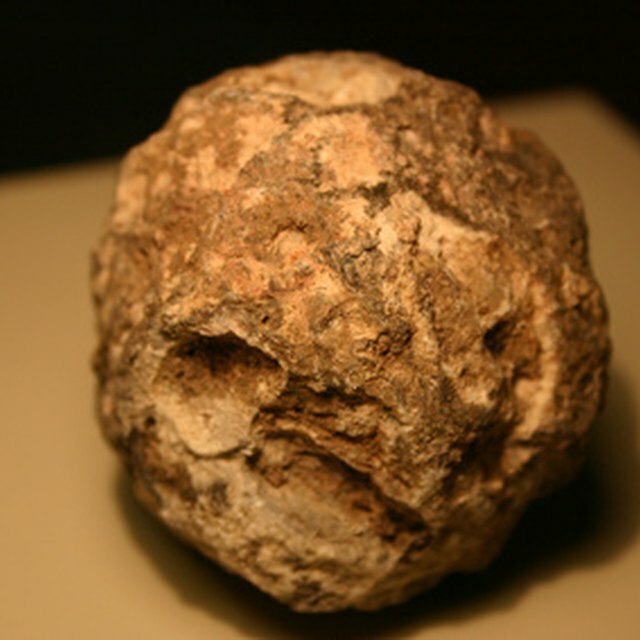 A nodule rock is a solid rock with no hollow center. So unlike geodes, the interior of a nodule rock contains no empty space. It does, however, contain minerals. Nodule rocks are harder than the rocks that surround them. They can be found in sandstone, shale or limestone. Some nodules contain iron. Pyrite nodules contain pyrite crystals. Others contain crystals or fossilized remains, even though their insides are not hollow. A quartz nodule, for example, contains an interior of quartz. Nodules can be concretions, which can reach many feet in diameter. These tend to be found alongside areas of erosion. Some nodules are septarian nodules, which are flatter and contain barite or calcite. 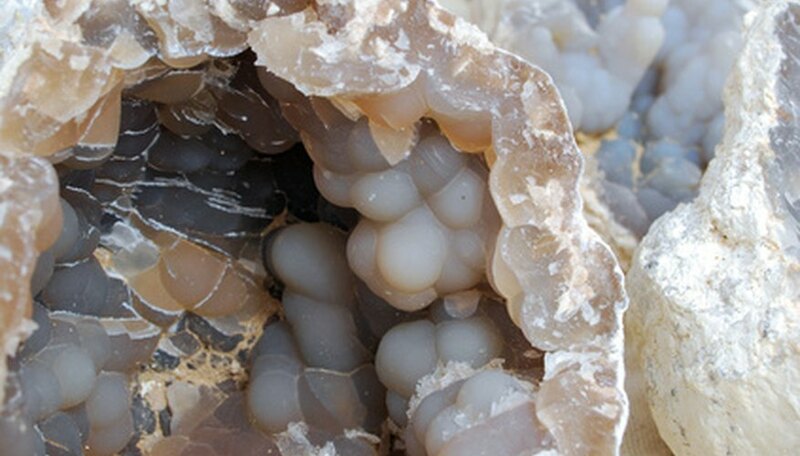 Other nodules are called thunder eggs, and these are made of chalcedony. Some collectors like to cut open septarian nodules and polish them for display. While nodules are not as popular as geodes, they are still prized, particularly beautiful specimens like quartz nodules. How Do Geodes and Nodules Form? Geodes can form through various methods involving chemical and physical processes. They can arise in volcanic rock bubbles, in sediment bubbles or in hollows of limestone. For volcanic ash bubbles, water passes into them over long periods of time, and these eventually solidify. For limestone geodes, a cavity forms from either geological or biological processes. Then, when water manages to get into this cavity, it carries any dissolved minerals along with it, and these can form crystals that grow toward the center of the geode. Some of these minerals, depending on their location, may have originated from ancient fossils of sea animals like diatoms and sponges. Some geodes even form alongside bituminous coal. Geodes that form in volcanic rock gas cavities are called amygdules, which contain bands of chalcedony and quartz, as well as calcite crystals. It is amazing to think how pressure, temperature, evaporation and long periods of time create geodes. Nodules are formed in many different ways, usually from sediments weathered and exposed to various chemicals in groundwater over time. Geodes can be fun to collect. So how can you tell if a rock is a geode? Many geodes are roundish in shape, so choose rocks that look like this for further inspection. Others may look like squashed melons, or could even be partially collapsed. Find a location known to have geodes and bring along a bucket, a shovel, and a hammer, and look for likely candidates. The only way to find out for sure if a rock is a geode is to break it apart by tapping it with a hammer, or have someone cut open the rock with a powerful saw. You'll know once you see the interior and whether or not there is a hollow or solid composition. The hollow ones are geodes, and as mentioned before, are often lined with crystals or layers of minerals. Some geodes are highly sought after and can be polished after being cut. Dianne, J.. "How to Tell the Difference Between a Geode & a Nodule." Sciencing, https://sciencing.com/tell-difference-between-geode-nodule-7634451.html. 15 October 2018.